At MAIN & VINE, guests enjoy a menu of intensely fresh cuisine inspired by the West Coast, all in an elegant yet approachable setting. “The days of rosemary air and molecular gastronomy are over,” declares Jay Stevens, operating partner and head of restaurant development for Main & Vine in Villanova. Put another way, Stevens believes a restaurant—or even a particular dish, for that matter—does not have to be pretentious or overly complicated in order to leave a lasting impression. And that’s exactly what he kept firmly in mind while he was creating Main & Vine. The restaurant, which made its debut in May, features a visually striking yet laid-back atmosphere, detailed service, and a menu inspired by Northern California—where the farm-to-table movement began—featuring imaginative dishes made with conscientiously sourced ingredients. Now open for lunch as well as dinner, this Main Line meeting place has quickly become a local favorite. In developing the concept, Stevens found himself leaning toward “an airy, natural, and organic feel.” Once he finalized his ideas for the concept, he sought out a talented chef who would understand and believe in his vision—and he found one in Charles Vogt. Chef Vogt brings to the kitchen of Main & Vine the warmth of his Italian-American childhood. His loves of Italian and French cuisines, along with the finest in distinctly American fare, have resulted in thoughtfully crafted dishes with contemporary flair. Prior to leading the kitchen at Main & Vine, Chef Vogt cut his teeth with some big names in the hospitality industry. He worked as a budding professional with Iron Chef Geoffrey Zakarian at The Water Club in Atlantic City, N.J., and then went on to spend six years working for Robert Wiedmaier’s restaurant group, which includes Brasserie Beck in Washington, D.C., and The Mussel Bar and Grille, which has locations in Maryland and Virginia. Having spent much of his career in kitchens so far from his native New Jersey, Chef Vogt says taking the helm of the kitchen at Main & Vine feels like a homecoming, of sorts. Guests can enjoy sandwiches, salads, soups, “Napa-style sourdough pizzas”, and entrées such as house-made pastas and a rotating menu of “Daily Supper” specials. When Chef Vogt refers to the dishes on the menu, he likes to use the word approachable. In other words, he believes a great dish doesn’t have to be overly complicated. 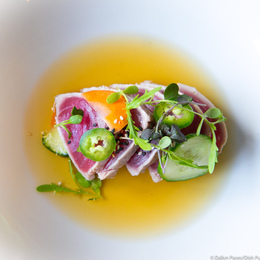 Each dish stars fresh, clean ingredients such as the finely sourced raw fish used in Main & Vine’s signature Tuna Tataki. Main & Vine strives to source ingredients locally whenever possible, with key items hailing from farms in Pennsylvania and New Jersey. Chef Vogt says the restaurant gets certain staples—baby artichokes, for example—directly from certified organic growers in California. While some menu favorites—the gloriously cheesy M&V Burger, for example—have a permanent home, Main & Vine breathes new life into the menu with each season. In fact, Main & Vine will soon be rolling out its winter menu, featuring the hearty and comforting foods one might expect from a Pennsylvania restaurant on the cusp of winter. House-made pastas will warm the soul, while a selection of dishes will feature local seasonal produce such as cabbage, squash, and root vegetables. Desserts will transition from chilled to nostalgic and warm. Still, Chef Vogt assures that the menu will retain its lighter Northern California influence. Regardless of season, the restaurant’s scratch kitchen features a number of dishes crafted with Old World reverence. For example, Main & Vine pickles its own vegetables and makes its jams and doughs in house. At its heart, the Main & Vine concept stems in large part from the lessons Stevens learned from his father, who instilled in him a certain set of values—namely, integrity, quality, and hard work. “My father raised me to believe that if I’m going to do something, I’m going to do it right,” Stevens says. “Everything about Main & Vine—from the food to the service to the atmosphere we’ve created—is built around that simple concept: doing the right thing.